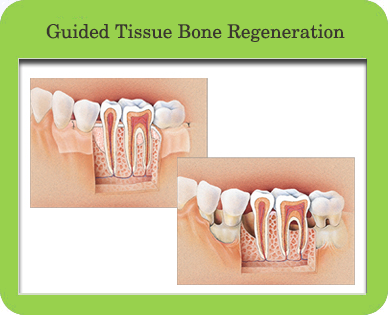 Guided tissue bone regeneration restores the previously lost gum and bone tissue. Most techniques utilize collagen membranes that are inserted over the bone defects. Some of these membranes are resorbable and some require removal. Other regenerative procedures involve the use of bioactive gels. The treated area is sutured closed and covered with a dressing. Dr. Roane will see you 7-10 days after the procedure for a post-operative appointment, at which time he will remove the sutures and dressing and evaluate the healing.